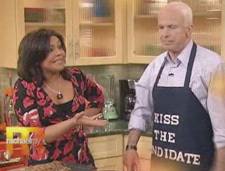 - Recap of the McCain/Rachael Ray glee-fest. - University of Georgia claims narcissists can be pegged by their Facebook photos. - Save your soul -- and the rotting souls of others -- while microblogging. Way to multi-task! - AIG yanks all corporate ad campaigns. - Why iTunes Genius is a boon to impulse digital music buyers. I'm still waiting for the day it can actually compile playlists for, like, half my songs, though. - Careful what you search. Brad Pitt and Beyonce are gunning for you. Well ... no, not really. - How Wall Street's collapse affects digital marketers. - Those plastic surgeons and their irresponsible, utterly misleading! ad campaigns. - Vaseline just for men. Like it wasn't mostly men using it anyway. - Autographed Denny Hamlin ad stuff on eBay. - More proof that Enfatico doesn't share our reality.